Some parents may think tummy time is a new fad, but in fact it is not. Before the realization that sleeping on tummies was unsafe, many babies spent most of their time curled up sleeping on their tummies. In fact, doctors used to recommend putting your baby to sleep on their tummy. The importance of tummy time is now being stressed due to the success of the Back to Sleep campaign. Now that we know babies who sleep on their back are at a lower risk of SIDS, babies are spending less time on their tummies. We need to make up this tummy time by reminding parents why it is important to a baby’s development . Beginning the first day your baby is home from the hospital, you should place him on his belly for 3-5 minutes 2-3 times each day. Note: Babies need to be under constant supervision when placed on their tummies!! As your baby builds tolerance you can lengthen the amount of time he spends on his tummy. 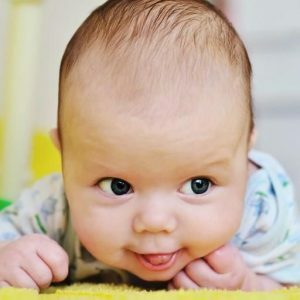 It is important to start tummy time from the beginning of your child’s life so they grow accustomed to it. As mentioned above, if they spend too much time on their back because they are not accustomed to tummy time, they can develop a misshapen head. In addition, tummy time encourages an infant to lift her head, a movement that strengthens the muscles of the neck and upper back. Your baby will need those muscles later on for rolling over, sitting, and crawling. 3.Lie on your back and place the baby on your chest. The baby will lift his head and use his arms to try to see your face.